How-To How to Shorten a Zipper! Ever accidentally purchased a zipper that was ridiculously long for the sewing project you are working on? Or perhaps, you just happen to have the same color zipper that you need on-hand, but, it's just too long! Just shorten that zipper! How, you ask? It's very simple, actually! We just need to create a new stopper so that the zipper doesn't separate at the bottom after we cut it. So, mark where you want to place the new stopper. Make sure you have an inch to spare at the end. We'll be cutting off an inch below the new stopper. I've stitched in green thread in this tutorial so that you can see it, but, you'll want to stitch with the same color thread as your zipper. Now, ziggity zag over the teeth where you marked several times. 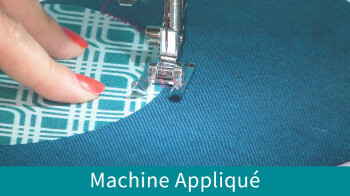 If you set your stitch length to move at a tiny stitch length of .1 or .2, you may need to hit the backstitch button to make sure the stitches are stitching over each other. 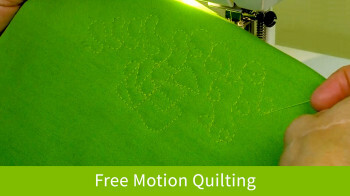 The goal is to create a tiny clump of stitches over your zipper end. See the next image. 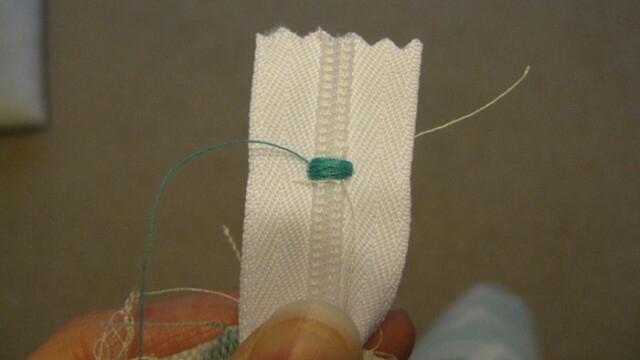 After you've created your new end, remove your zipper from your sewing machine. I like to then add a dab of Fray Check (or the like) on the top and bottom of the stitch clump to hold everything in place. I'll typically clip the end of the zipper with my pinking sheers (slowly over the teeth) for poly zippers. When I've done this with a metal teeth zipper, I'll clip the tape with my pinking sheers (if I can) up to, but not on the teeth. Then, I'll take some tiny clippers if I can get in between the teeth or a pair of wire cutters to clip the end off. You also have the option to cover the end with a square piece of fabric. To cover your zipper end, cut a 3″ x 5″ piece of scrap fabric to hide the zipper end. Iron down a 1/2″ along a 3″ edge to the wrong side of the fabric. Place fabric on zipper as shown, lining up the ironed edge just a bit above the zipper. 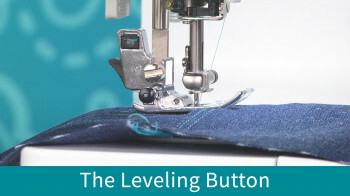 Stitch through fabric and zipper no larger than a 1/2″ seam allowance only for the width of the zipper. Then, fold down and iron. Flip your zipper over and iron down the other raw edge a 1/2″. Then, fold and iron the fabric piece over the zipper. Next, fold your raw edge under and in and iron again (if you need to trim down the fabric, that is perfectly fine)! Stitch close to the edge around the entire square of folded in fabric. Again, be very careful when sewing over the metal teeth at top and bottom of square; use the handwheel and if you need to advance your fabric forward a tiny bit to clear the teeth, go ahead and do so! It's an easy, nice looking option, as well! It's so easy to shorten a zipper!